Tracey McGrath’s keynotes have set attendance records at conferences and corporate breakfasts. Engaging and interactive, coupling content with emotional intelligence, Tracey McGrath satisfies everyone from frontline staff to the executive elite. With over twenty years experience, Tracey McGrath is a proven conference speaker you can rely on to have professional behind the scenes processes as well as a dynamic onstage presence. Here is what other’s have said about Tracey McGrath. Our organisation has engaged Tracey on many occasions and we always walk away totally satisfied all our planned outcomes have been achieved. Tracey is very engaging, thoughtful and on message. Her unique techniques and physical interactions within the group ensure our people enjoy her presence and take away valuable information at the same time. Tracey has been the keynote speaker on the opening day of the Curtin Ignition program in 2013, 2014 and 2015. Her contribution to this world class high profile entrepreneurial education program, delivered by a high profile team of speakers, mentors and contributors has always been highly rated by the attending delegates and in 2014 she was voted the highest rated speaker. What a great start to our conference, you set the scene for the weekend and all delegates found you presentation very enlightening and had a laugh along the way. Great work thank you. This year’s ICAA Business Forum attracted approximately 800 registrants in total. Your conference session, “Avoiding Professional Burnout” was well received. the feedback from participants of the conference was extremely positive and the registration numbers reflect an acceptance by our members of the program was particularly relevant to the sector. Your address to delegates on avoiding professional burnout was very well received. Delegates our valuations rated your session at 8.8 / 10. Thank you for your keynote, “The total team: Viva la difference” at our recent staff conference. We are continuing to receive extremely positive feedback from our staff members. Having you kick start the day really got everyone “in the mood”. Your presentation certainly encompassed the message which we were trying to get across and was delivered of in a fun and enjoyable manner . The colour exercise was extremely relevant to our activities over the course of the day and remains a point of discussion. Once again, thank you. It was very refreshing dealing with someone who obviously enjoys and believes in what they do and we would certainly have no hesitation in recommending you to other organisations. Feedback from the delegates was very positive with many teachers taking away many new resources and ideas to try out their classroom. Looking forward to working with you in the future. 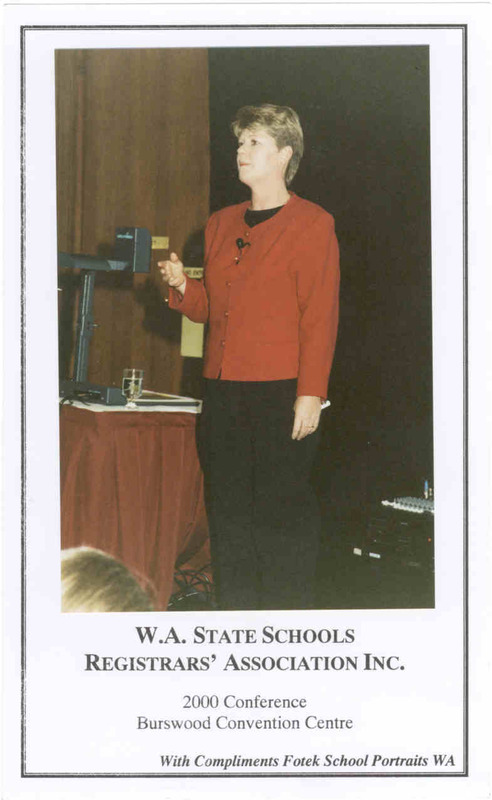 Thank you for speaking about 2001 Mandurah Education Conference contributing to its success. Here are some of the comments from your “Avoiding Burnout” keynote address. Thank you for your keynote, “Managing Stress and Preventing Burnout” at our recent staff conference. Feedback from delegates has been overwhelmingly positive with most of them rating your session as “excellent”. The positive feedback received is directly related to the energy, humour and knowledge that you displayed. Importantly, delegates were left with a powerful message regarding stress and burnout. Tracey, I have no hesitation in recommending your services. I look forward to seeing you at our Canberra conference. Thank you for presenting such a dynamic seminar on “Managing Staff Diversity and Reducing Conflict”. Your topic drew a record attendance of 284. My committee is delighted with both the turnout and the content of the seminar. Personally, I was really pleased that you managed to deliver what was promised, in the timeframe and still make it all seem such good fun. I always feel the mark of a true professional is to make it all look so easy. You certainly did that and I am looking forward to our next seminar on 15 May. Thank you for your seminar presentation. I’m delighted to advise all the comments I’ve received from those participating have been excellent. Everyone found both sessions to be very interesting and I know that many of the people I have spoken to a certainly trying their best to remember to apply the “colour factor” in their daily lives! One of the best accolades, I believe, is that so many attendees said they would have really like the sessions to be longer. Considering this seminar was held on the Saturday, I believe this speaks volumes to your ability as a speaker to capture the group’s attention by presenting your topic in such a highly informative and entertaining manner. The active “audience participation” was also very well received and it certainly helps to bring the points home. I look forward to signing up for your next enlightening session! Thank you for participating in our “Convention 2000” held at the Burswood recently. Your session on “Making Effective Communication Easy” was a very popular one according to our feedback from members. Your presentation contributed to an outstandingly successful convention. Look at the overhead projector in the background – how times have changed! Thank you for addressing the registrar’s conference last Thursday. The survey sheets showed strong support for your presentation as being one of the most popular segments of the conference. You had many of the registrars conversing as to what colour they were. Thank you for your presentation on “Managing the Angry Person” at the StateWest Executive Seminar Breakfast. As you would have gathered on the day, the response was excellent and the feedback has been very positive. Out of 226 bookings, only six were absent on the day, which is a record. Your presentation was both professional and entertaining. I always find humour helps me remember. If I see people at Target or Kmart peering at the backs of peoples’ knees, now I know why. Thank you for your informative presentation at our annual conference. The evaluation sheets indicate that your session was very well received by delegates with many wanting more information. I hope you also found value in participating in our conference and would be available in the future to further extend the professional development of our membership. Again, thank you for your professional, entertaining and informative contribution. Tracey spoke at our State conference (“The Way to Win”) to 130 financial advisors. The subject was how to handle anger and angry people. To this end, Tracey was vibrant, enthusiastic and very informative with all attendees taking in her message intently. With the above mentioned in mind, I would have no hesitation in recommending Tracey McGrath is a conference speaker.